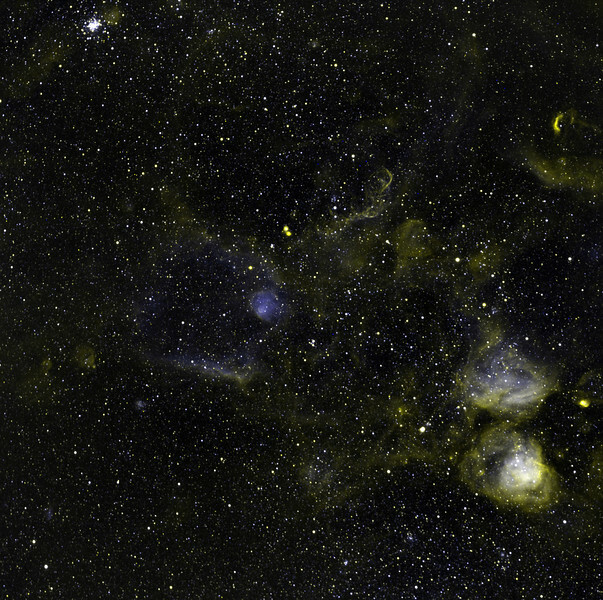 A rarely photographed region in almost the exact centre of the Small Magellanic Cloud. The tiny globular cluster at top left is NGC 330. The other structures are faint and not in the NGC. Yellow: H=alpha 5hrs. Blue: OIII 5hrs. Various large disrupted ring-like structures are seen. Notice in particular the scalloped, gold filigree shock wave complex at about 1 o'clock from centre, which (speculating with little evidence) could be part of an old supernova remnant. The field as a whole is very faint in [SII] (not shown) but the filigree is visible in [SII]. The small, bright yellow arc at the top right edge is intriguing. Field 36' wide, North up. Aspen 16M on 20" PlaneWave.